Palm Bay: Give A Listen. The Holton Recording Does Not Support His Claims. Yesterday we posted about the audio recording that Palm Bay City Councilman Calvin “Tres” Holton claimed he had that cast aspersions on the honesty of the signature gatherers that are gathering signatures to place on the ballot a return to 2016 language in the City Charter concerning special assessments and the process of levying those assessments. Holton: If people are collecting petitions there’s a process in our charter in a state statute for a reason. We can’t automatically assume that they’re going to can they’re going to get all of the petitions signed. We don’t know whether the petitions that they have a legitimate real signatures or not, the only person that can verify that information is the supervisor of elections. Moreover we don’t know if if there’s been certain tactics involved and lies and stuff like that, you know that are being done by the some of the folks that are collecting petitions that would require a possible injunction, or some type of investigation by the city. I can tell you this much, I was sent an audio file of of the petition collectors at the first Friday event where they were lying to a person to get petitions and they were using tactics that I find absolutely atrocious. And if this continues forward like this…. Bailey: Can you provide that to the rest of Council? Holton: I’d be more than happy. I think it’s audio that the general public needs to hear, and most important we need to hear, because if those are the tactics the petition collectors are using, that’s very inappropriate, extremely inappropriate. And talk about confusion, I’ve got some concern about that. So I’ll be more than happy to provide a copy of the audio file. We don’t have all the petitions we don’t know if they’re legitimate petitions in at least from my point of you and I’m sure if you hear the audio you understand we’ve got people out there lying to people to get them to sign. Bailey: I know there’s been a lot of accusations, and I try to refrain from that I think that that is been a….. I’m just curious, when did you receive that file? Yesterday, some folks went up to City Hall and spoke to some people about the file being a public record. More emails were sent showing that by statute, the recording was a public record. Late yesterday, the City released the recording. You can download it here or listen below. The audio is hard to hear in some places, but the signature gatherer actually says to the potential signer “let’s move over here so we can talk.” To us, that means that the signature gatherer wanted the woman she was talking with to be able to hear and understand what the petition was about. Contrary to Holton’s inferences, there is no attempt to deceive anyone that we can find. The signature gatherer was open and honest. The “meat” and most important part of the conversation comes up at the 2:40 mark of the recording when the potential signer says that she doesn’t have her glasses with her. The signature gatherer asks if the woman would like her to read the language of the ballot initiative to her and the woman agrees. Do yourself a favor and go back to that point on the recording and listen as the initiative is read and follow along with the text below, which is a copy of one of the petitions. There is no difference between the text and what is read. Contrary to Holton’s assertions, there was no lying to the potential signer when she was read the proposed ballot language. The signature gatherer offers to fill in the name and the address of the farsighted woman and she does. The filling in of that part of the petition is legal. The woman then signs the petition. There is some small talk about the number of signatures required to get the initiative on the ballot, who is the head of the petition drive, etc. All of the petition signer’s questions are answered. Perhaps Holton finds that helping a person understand and reading aloud to them is an “atrocious tactic.” Instead of being kind to the woman, perhaps Holton would have preferred the signature gatherer tell the woman “sorry, you can’t participate in this legal and democratic process,” even though what the what the signature gatherer did was legal in every way. However, there is something else that not many people are talking about (no one has mentioned it as far as we know) and we purposely did not bring it up until now because we didn’t want to cloud the issue of the existence of the tape and Holton’s lies about it. ……some of the folks that are collecting petitions that would require a possible injunction, or some type of investigation by the city. There is no doubt that Holton is against the petition drive. Therefore his call or suggestion that the City look to get an injunction against those involved in what is clearly protected political speech is devoid of any understanding of free speech, the Constitution and the law. Just as awful, Holton thought that perhaps the City should “investigate” the petition gatherers. It never thought to cross the mind of Holton that what he was suggesting and putting forth was akin to ideas in totalitarian regimes. Disagree with elected officials? Hey, let’s get an injunction to shut them up. Speak out against something? Get investigated. From taking part in the democratic process…..
You have no idea how angry that makes us. Just below that is the anger that no one up on the dais called him out on it. No one called him out on his suggestions to target citizens for being opposed to ideas he holds. COUNCILMAN CALVIN TRES HOLTON CONTINUALLY VIOLATES HIS OATH OF OFFICE TO PROTECT THE US AND FLORIDA CONSTITUTIONS, AS WELL AS THE LAWS OF THE CITY OF PALM BAY WHICH ALL PROTECT SPEECH. We are going to sit back and try to figure out where to go with this whole mess. We cannot fathom the idea that a sitting Councilman lied and slandered two people and impugned others. We cannot fathom the idea that a sitting Councilman lied to his fellow Councilmen and the people of Palm Bay during a discussion. 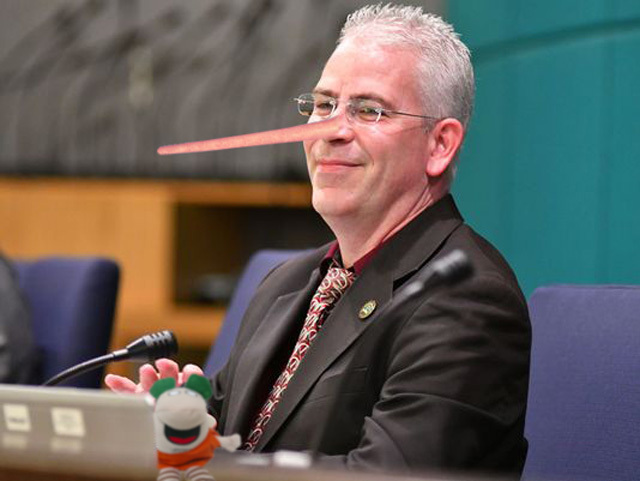 We cannot fathom the idea that a sitting Councilman lied that the recording wasn’t a public record. We cannot fathom the idea that a sitting Councilman broke the law on public records. We cannot fathom the idea that a sitting Councilman wants to stop people from talking. We cannot fathom the idea that a sitting Councilman wants to investigate those who disagree with him politically just for disagreeing. There are very few times that we as a staff here at Raised on Hoecakes are unsure of what should happen next. This is one of those times. Some have called for an apology from Holton to the two signature gatherers he accused during the Council discussion, and a censure from the City Council as he lied to them. While that addresses the false accusations, it doesn’t address the lies to the public. It doesn’t address the breaking of the Sunshine laws when it comes to the public records. It sure as heck doesn’t address his attack on the Constitution and people exercising their Constitutional rights. The next City Council meeting is this coming Thursday, August 2 at 7:00 PM. Maybe by then we’ll have some ideas and direction we can put forth to the hoecake eating masses. Until then, if you have any ideas, drop is a line through the “Contact Us” page above, or leave a comment on this post. I’ve still got my “DUMP HOLTON” sign from the last public demonstration at City Hall…. If anyone else is gonna be there I’ll join them. Calvin needs to be dismissed from his council position immediately, he does not serve the taxpaying voters, he serves himself. This is not the first (not I’ll bet the last) time he has lied. He is accountable to me, and my neighbor, and the guy down the street and the little old lady in NE. This is not the Calvin “tres” Holton show, past time to terminate his contract. Thank you for addressing Tres’ mention of the injunction and investigation. I thought it was a violation of the 1st amendment (free speech, right to protest, and right to petition) and possibly the 4th (illegal investigations, searches, and seizures). I’m wondering what the legal repercussions are for a sitting councilman to ask the council to violate the citizen’s constitutional rights? Fill out and mail in. As ROH has completely given us an accounting of this non-stop ridiculous behavior by Holton. His buddy Santiago seems to be wavering a little, as the ship keeps sinking. “Napoleon complex” is a theorized complex occurring in people of short stature. It is characterized by overly-aggressive or domineering social behavior and carries the implication that such behavior is compensatory for the subject’s stature. When the tiny shoe fits, one eats Little Caesars. Let’s vote this little boy out. The making of this tape is a felony of the Third Degree. I cannot fathom a sitting councilman committing a felony, and keeping his job, that he was elected to do. I know for a fact, one major reason for being removed from office, is committing a felony. There is no expectation of privacy on a public conversation like the one that was recorded. Therefore, there was no crime committed. We can give lots of examples of this lack of expectation of privacy in a public place and will gladly do so if someone requests. But have we ignored, they are not working with law enforcement. So conspiring to entrap, with intent to defraud? When his mom clearly said she lived in PB, (lie) that she could vote in PB (lie) and the petition says under penalty of perjury, she did not use her name. The expectation of privacy was there, do to the confidential nature of the petition’s signature. Clearly, we are a two-party consent state, period. It does not matter that the recording was not made with the support of law enforcement. If you are outside in a public space, there is no expectation of privacy and so an “oral communication” can be recorded. There is an exception to that in that either party can say “let’s step over here where we can talk privately,” and that would establish an expectation of privacy. There are even court cases which say that out in public, the expectation of privacy must be asserted and not assumed. That didn’t happen in this case. We just don’t see how a petition gatherer and a potential signer, at an event with hundreds of people, talking about a public issue, can claim there is an assumed expectation of privacy. Secondly, the person can lie all they want while talking. Just as the signature gatherers can lie. Signing the petition is different and as you stated, subject to perjury. Third, the signatures are not confidential. They are a public record. Florida is a two party consent state when there is an expectation of privacy. That’s not what we are dealing with here. I’d like to order 3 stacks of Hoecakes and cuffs and 1 pretty pink stack for the Bimbo. Give them all coke and soap on the rope. Out with the trash. In with the class.